THE MICHIGAN LEGISLATURE, IN ITS WISDOM, believes it has found a way to boost bicycle safety. All that’s needed is two simple changes to existing laws. 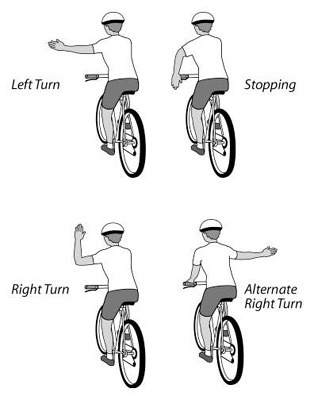 The first proposed change allows a cyclist to signal a right turn by extending the right arm, rather than upturning the left arm at a right angle. It passed the Michigan House unanimously. The second change (so-called “vulnerable roadway user” legislation) increases the penalties – fines and/or jail time – for injuring or killing a cyclist when driving a motor vehicle. It’s expected to pass with strong bipartisan support. Well, bravo. It’s nice to know our elected officials can agree on something. If only I thought it was actually worthwhile. As someone who cycles more than 1,000 miles per year, and occasionally does multi-day trips of 200 miles or more, I think I have a pretty good idea of what could improve my safety when riding. And despite endorsement of the two proposed changes from the League of Michigan Bicyclists, I cannot share in the optimism. Does increasing penalties reduce accident frequency? There is a precedent we can check. In 1996, Michigan doubled penalties for traffic violations in work zones. According to data from the Michigan Department of Transportation, reported accidents in work zones increased from around 3,000 per year in the early 1990s to over 6,000 ten years later, and while that rate has dropped recently (see chart), the average remains about 5,000 accidents per year. Doesn’t look like much of a preventive effect there. And I fail to see how increased penalties for hitting a cyclist is going to reduce the frequency of motor vehicle-bicycle accidents. It isn’t fear of financial loss or jail time that makes me an attentive driver, it’s the thought that my inattention could cause me to hurt or kill someone. You cannot legislate that attitude. Better training and awareness might help, but I didn’t see those provisions in the bills. I know there are people who believe, despite Michigan’s share-the-road laws, that bicycles don’t belong on roads. I’m not mainly worried about them when I’m biking, nor the people who think it’s fun to honk their horn as they pass, or roll down the window and bark like a dog. At least they know I’m there. What worries me are the people who don’t. 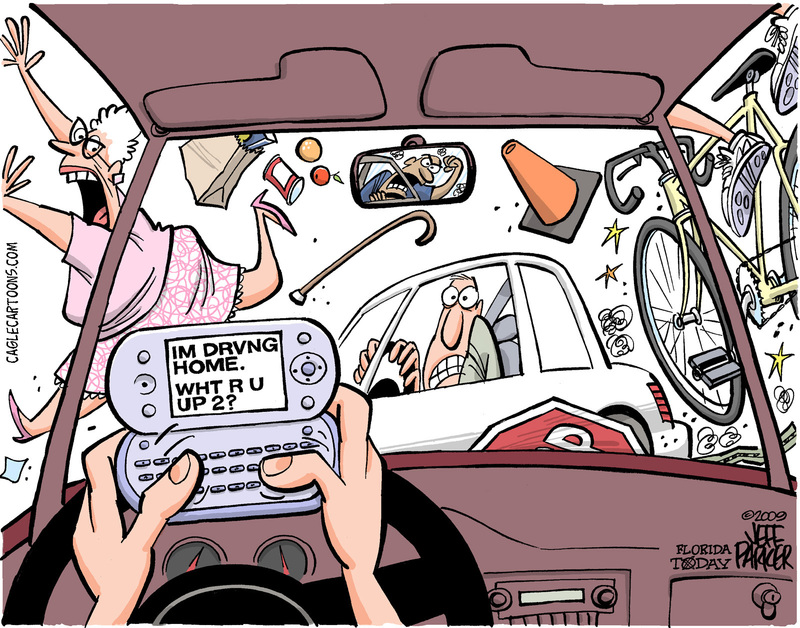 And on that note – a recent crackdown on ‘distracted drivers’ in the Chicago area resulted in 135 tickets issued, mostly for texting while driving, despite warnings posted on electronic signs that an anti-texting operation was in progress. Perhaps they were too busy looking at their phones to read the signs. Hey, Michigan Legislature: you want to increase road safety for cyclists? How about more bike lanes or wider paved shoulders? Better yet, how about more multi-purpose trails so we don’t need to ride in the road? What? Yes, I’m aware that costs money. And I understand that changing a couple of trivial laws is easy, costs little, and makes it look like you’re doing something useful with your time and our taxes. Yes, once I can stick my right arm out I will feel so much safer. Would it be appropriate to show my appreciation by extending my longest finger as well? This entry was posted in Running & Cycling and tagged 50, accidents, Cycling, distracted driver, fitness, League of Michigan Bicyclists, legislation, Michigan, safety, vulnerable roadway user. Bookmark the permalink. Oh, dear. What will they think of next? Is there a helmet law in Michigan? Not sure how to get people to actually see bicyclists. . . I definitely like the off-road options. We have a few, here, in Oregon. Michigan does not require cyclists to wear helmets. There was a bill to require them for children, but it never passed. The Legislature, in its wisdom, repealed the motorcycle helmet law last year. Head injuries from motorcycle accidents have spiked since then. Go figure. But the real issue to me isn’t helmets, it’s preventing accidents by a) cyclists making themselves highly visible and b) drivers being attentive. Common sense that is neither, I suppose.